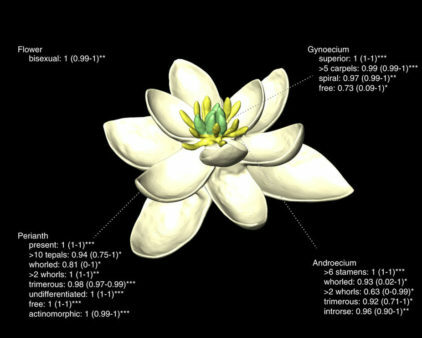 Three-dimensional model of the ancestral flower reconstructed from the analyses. Recent advances in molecular phylogenetics and a series of important palaeobotanical discoveries have revolutionized our understanding of angiosperm diversification. Yet, the origin and early evolution of their most characteristic feature, the flower, remains poorly understood. In particular, the structure of the ancestral flower of all living angiosperms is still uncertain. In their paper, published on August 1, 2017 in Nature Communications Hervé Sauquet et al. report model-based reconstructions for ancestral flowers at the deepest nodes in the phylogeny of angiosperms, using the largest data set of floral traits ever assembled. The authors reconstruct the ancestral angiosperm flower as bisexual and radially symmetric, with more than two whorls of three separate perianth organs each (undifferentiated tepals), more than two whorls of three separate stamens each, and more than five spirally arranged separate carpels. Although uncertainty remains for some of the characters, this reconstruction allows the researchers to propose a new plausible scenario for the early diversification of flowers, leading to new testable hypotheses for future research on angiosperms.